When the VW New Beetle was born in 1998 it immediately became clear that it would try to make a success as the classic VW Beetle. This has not happened so far, but the VW New Beetle became a true bestseller for the German car manufacturer. In 2011, the VW New Beetle was succeeded by the Volkswagen Beetle A5, which does not alter the fact that it still enjoys considerable popularity today. Are you also the owner of this car, but are you urgently looking for interesting solutions in the field of a windscreen replacement of a VW New Beetle? In that case we will be happy to help you! 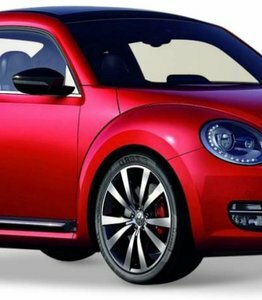 Before we go into the possible damage that can occur to the windscreen of a Volkswagen New Beetle and the consequences that this damage can have, it is perhaps interesting to take a look at the origin of this nice passenger car. The New Beetle was developed by the German manufacturer Volkswagen as the successor to the classic and, moreover, extremely popular Volkswagen Beetle. What many people don't know is that the study model for this new car was already presented in the year 1994. However, at that time she was called 'Concept 1'. Production of the successor to the Beetle did not finally start until 1997. The presentation to the public followed less than a year later. How does damage occur to a VW New Beetle windscreen? Despite the fact that a VW New Beetle windscreen is made of laminated glass, this does not mean that it will be protected from damage. In fact, given the location and size of a windscreen, it is particularly prone to damage. Driving on a motorway at a considerable speed and seeing a stone popped up against the windscreen can, for example, already cause an asterisk to appear. Is there a bird or a swan flying against the windscreen of your VW New Beetle? Then you even run the risk of a big crack. In the worst case, the windscreen is even completely shattered, making it impossible to drive the car. In several of these situations, the only solution you have is the damaged windscreen replacement of your VW New Beetle. Only in the case of an asterisk is it not necessary to replace the windscreen. Is the windscreen replacement of your VW New Beetle mandatory in the event of a crack? Contrary to what many owners of a VW New Beetle suspect, replacing a windscreen in case of damage is not always mandatory. A rejection of the APK will therefore only threaten at the time when it has to be established that the damage to the windscreen negatively affects the driver's view of the road or that there is a crack with branching. Replacing a VW New Beetle windscreen in the event of damage is therefore by definition not mandatory in all other cases, but is highly recommended. The stiffness of the chassis of a VW New Beetle is achieved for approximately 40 percent by the available automotive glass. Any cracks or other damage can therefore, in principle, cause this stiffness to be compromised. It is unnecessary to say that you will want to avoid this at all costs. What if you are not insured against glass damage? Buying new car windows is not a problem in itself, but what exactly is the price of a VW New Beetle windscreen? This can be quite substantial at the moment you choose to buy a new, original car window with a brand logo. Such automotive glass may therefore in the first instance only be sold by authorised brand dealers. With the necessary regularity there will be offered on the second-hand market, even there the costs for a VW New Beetle windscreen are often still much higher than you would expect. If you are not insured against glass damage, you are not waiting for it at all. Fortunately, there is a financially very interesting alternative to replace the windscreen of your VW New Beetle. You can choose to buy an after market windscreen with us. If your windscreen replacement is not insured, then it remains financially feasible in this way and that also without having to compromise on quality. An after market car window is produced in the same factory as the original ones and is also part of the same production line. As a result, the most optimal price-quality ratio is always guaranteed. Both the original New Beetle which came on the market in 1994 and the VW New Beetle Cabrio which saw the light of day in 2003 can happen that a broken windscreen ensures that you can no longer drive the car. In that case, of course, you have a major problem, or not? When you are confronted with, for example, a shattered windscreen, you always have the possibility to have it replaced on location. In this way, our certified partners can ensure that you do not have to run any risks and that you are always assured of an efficient and inexpensive solution. In other words, are you confronted with a shattered windscreen at your VW New Beetle and are you looking for the most interesting solution in terms of price quality? If that is the case, we will undoubtedly be able to help.